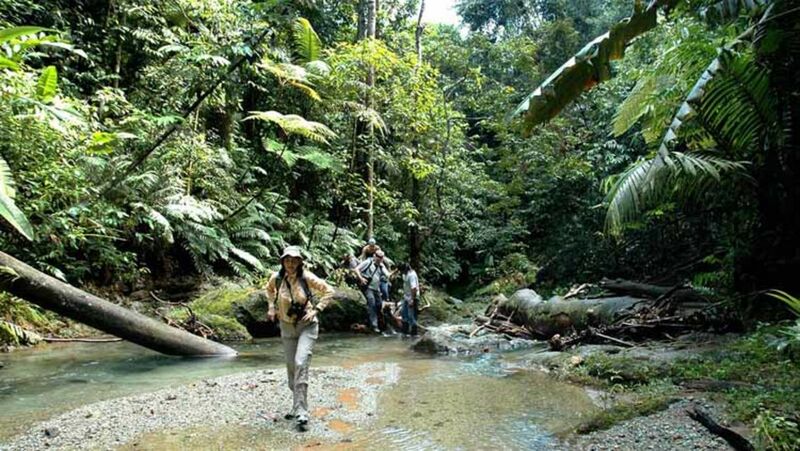 Esquinas Rainforest Lodge offers a variety of exciting tours and excursions: day, night and birding hikes in Piedras Blancas National Park, a horseback tour in the valley of La Gamba, boat or kayak tours in the Golfo Dulce, and an adventure tour to Bonito Valley. Since there are no other lodges near us, you will rarely encounter any other tourists on your excursions. For a detailed description, scroll down the page or click on each tour on the left column. Don‘t miss a hike with one of our local guides! The Esquinas forest is categorized as a „lowland tropical wet forest“ and contains the highest density of trees (over 140 species per hectare) in Costa Rica and a total of 2.500 species of plants! Our network of trails includes easy, almost level trails through secondary growth forest and longer, more challenging trails that lead into untouched primary rainforest. There is a good chance to see colorful birds, shiny butterflies, bizarre insects, frogs, or possibly monkeys, agouti-pacas, coatis or even a wildcat. Price: 1 person $30, 2-4 persons $25 p.p., 5+ persons $20 p.p. A favorite among our guests! This hike starts after dinner and provides an opportunity to experience the forest by night. Our guide takes us through the riverbed of Quebrada Negra and through the garden of the lodge. 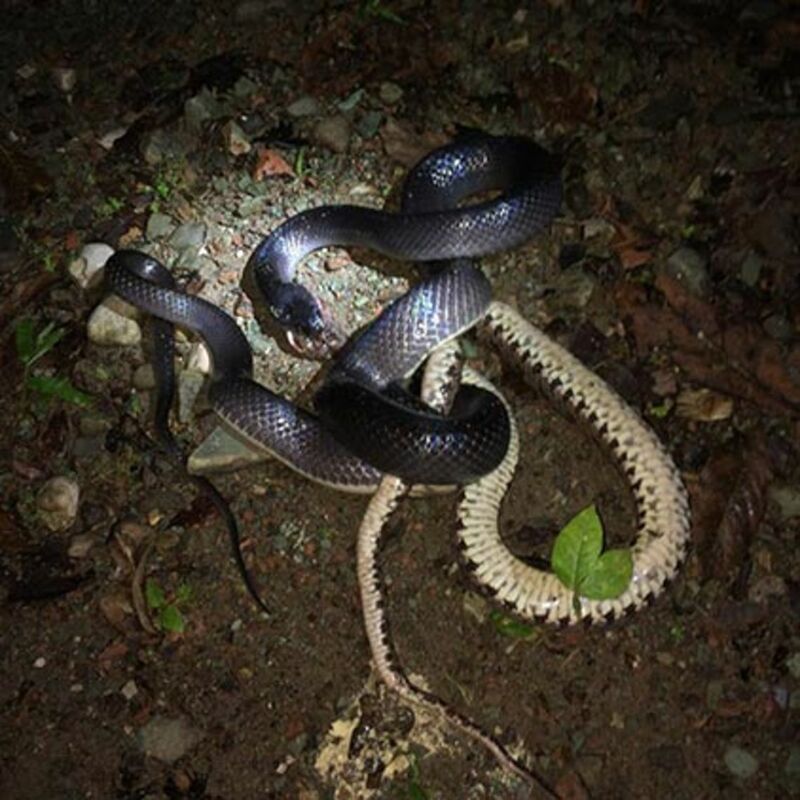 Nocturnal wildlife to be seen includes snakes, frogs and toads (our record stands at 17 species on one single tour! ), bats, owls, spiders and maybe bigger mammals. This tour with one of our local guides utilizes the trails in the forest as well as the road to La Gamba, open pastures, and riverbeds. Birds to be seen in the forest include Trogons, Motmots, Woodpeckers, Manakins and the famous „Black-cheeked Ant Tanager“, endemic to the Golfo Dulce area. The bird fauna of the more open areas includes Parrots, Curassows, Parakeets, Egrets, Flycatchers, Hummingbirds and Toucans. Animals often sighted include agoutis, coatis, basilisks and caimans. Our wildlife hike departs around 6 a.m.and returns in time for breakfast and other tours. Price: 1 person $30, 2 persons $25 p.p., 3 persons $20 p.p., from 4 persons $15 p.p. Our popular horseback tour leads through the town of La Gamba to Chorro Waterfall, where you can bathe or climb up to a natural pond above the waterfall, surrounded by beautiful rainforest. Previous experience in horseback riding is not required for this leisurely tour, but for safety reasons children under 12 years are not allowed to ride their own horse. Our guides are used to following your instructions; just tell them whether you wish to walk, trot or canter. Those who prefer not to ride a horse can do the same tour by bicycle. Don't miss the opportunity to see researchers at work! The internationally acclaimed station, an 8-minute walk from Esquinas Lodge, is run by the University of Vienna and is dedicated to investigation and research in the surrounding forest. More than 100 bachelors and masters studies have been undertaken at the facility. The station's „Field Guide to the Golfo Dulce Rainforests“ is a standard book among botanists worldwide. Researchers and students and an Austrian civil servant are on hand most of the time. Visits and tours are possible Monday through Saturday from 8 to 5. Donation for entrance: $ 8.00 p.p. Guided tour: $ 18.00 p.p. After a drive through the rainforest to Golfito, our motorboat takes us along the untouched, barely inhabited coast of the Golfo Dulce, where the jungle meets the beach. Pelicans sit in the trees, and there is a good chance of seeing dolphins. After an hour, we reach Casa Orquídea, a beautifully landscaped private tropical garden with hundreds of species of ornamental and edible plants. After a guided tour, there is time for swimming on the beautiful beach and a picnic lunch. We return to the lodge between 3 and 4 p.m. The mangroves of the Rio Coto estuary contain an incredible array of wildlife: numerous species of waterbirds, parrots, howler, white-faced and squirrel monkeys, caimans and crocodiles. Our boat tour through the meandering mangrove swamp, where it is unlikely to encounter any other tourists, is preceded by a drive through the rainforest to Golfito and includes a stop at a beach for a picnic lunch and a swim in the warm waters of Golfo Dulce. After a drive through the rainforest to Golfito, we board a motorboat for a scenic trip around Golfo Dulce, a fjord which separates Piedras Blancas National Park and the Osa peninsula. Three species of porpoise live and breed year-round in the gulf. 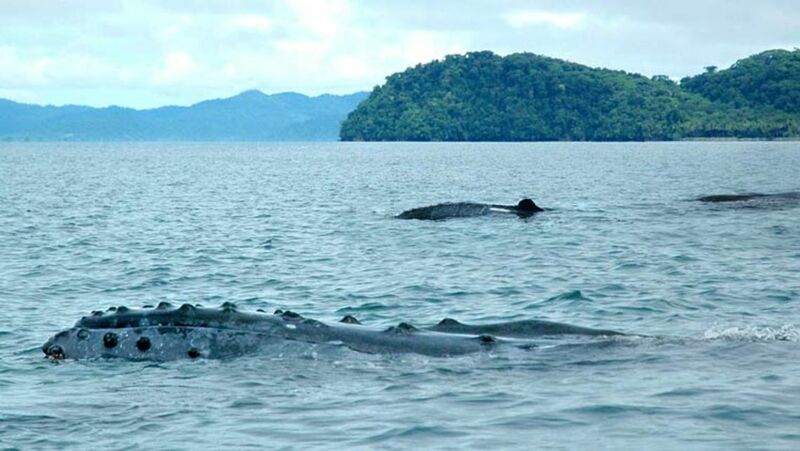 There is a 90% chance of observing bottlenose dolphins playing and swimming by the boat, and during certain months humpback whales and whale sharks can be seen. The tour includes a stop in Puerto Jimenez with a short walk to a mangrove swamp to to look for scarlet macaws, caimans, crocodiles and monkeys.